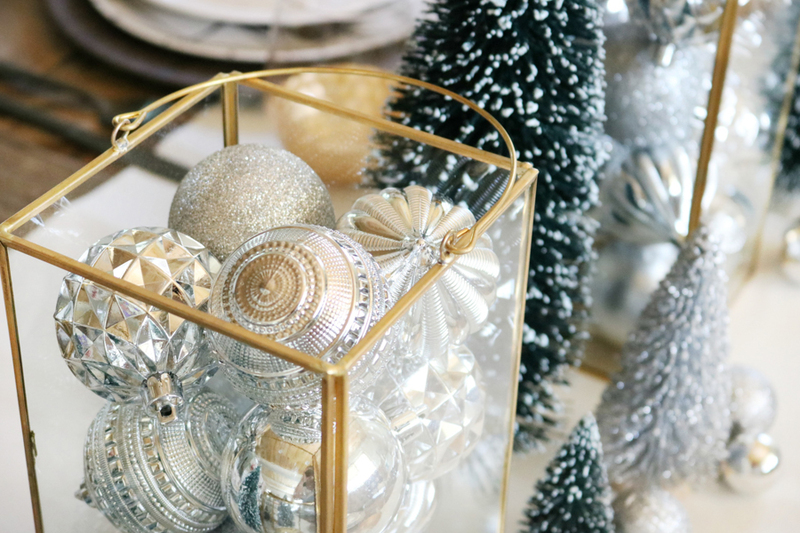 Tis the season of entertaining! 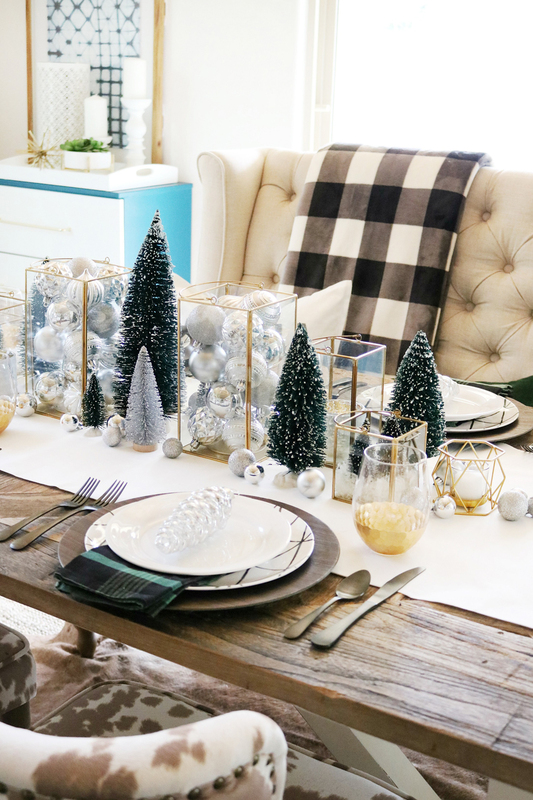 I typically don’t get a chance to decorate a table or host a dinner where an actual centerpiece is involved because our small house doesn’t really have a space for a full-size table. 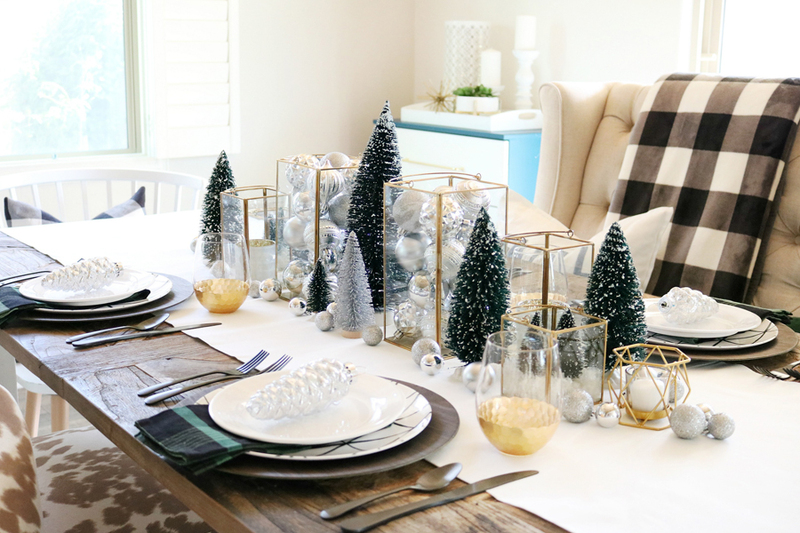 I’ve been really wanting to put together easy holiday table decor lately, so I convinced my bestie Rebecca from Make and Do Studio to let me borrow her gorgeous house to create some Simple & Modern Christmas Dining Table Ideas. 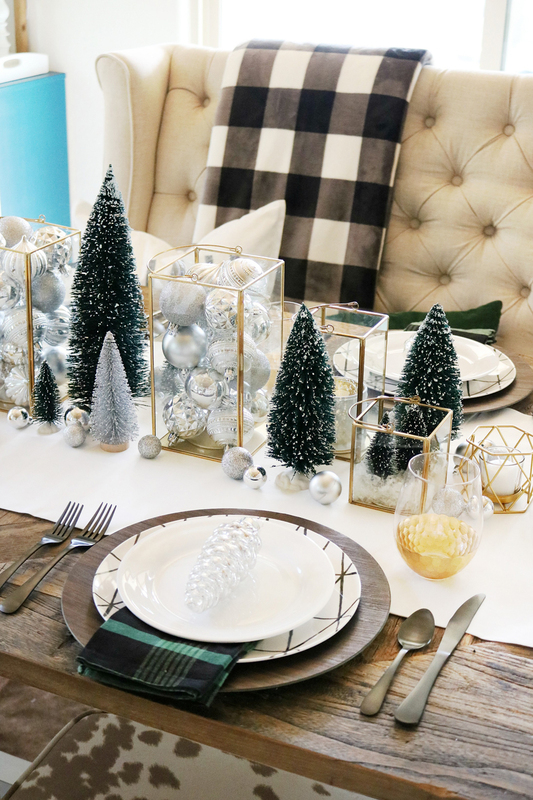 I knew three things when I was planning the Christmas table. I wanted it to have a simple and a bit of a modern look with mixed metallics. 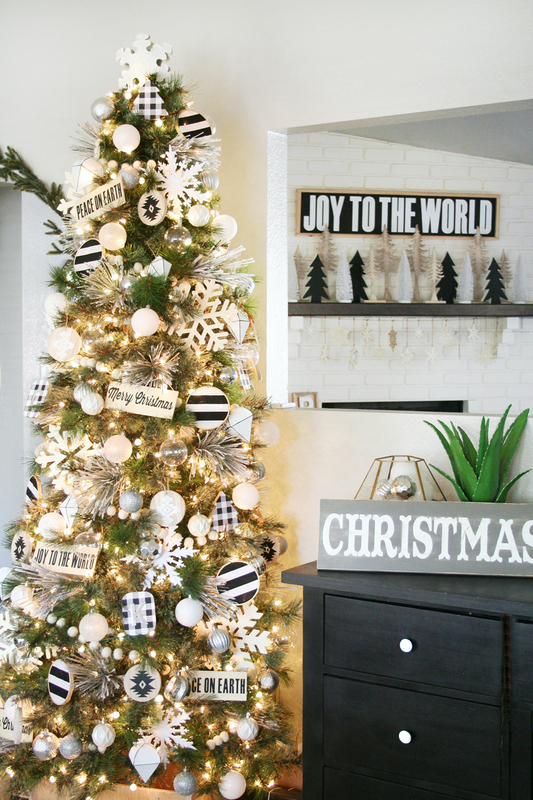 I also wanted it to be mostly neutrals, I was thinking black and white of course but I love the pop of deep green I was seeing all around this year and wanted to incorporate that. 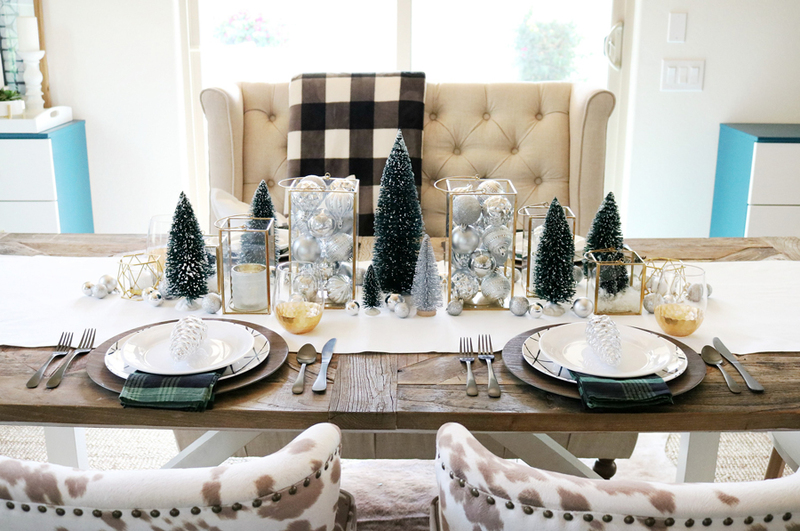 To start I used white cotton fabric to create a runner down the center of the table. I used plain 45″ by the yard fabric that I folded in half to create a thicker runner. If you are looking for something a little bolder to add more color to your table try adding something with a pattern that isn’t too busy. Polka dots or a buffalo check would be really fun. 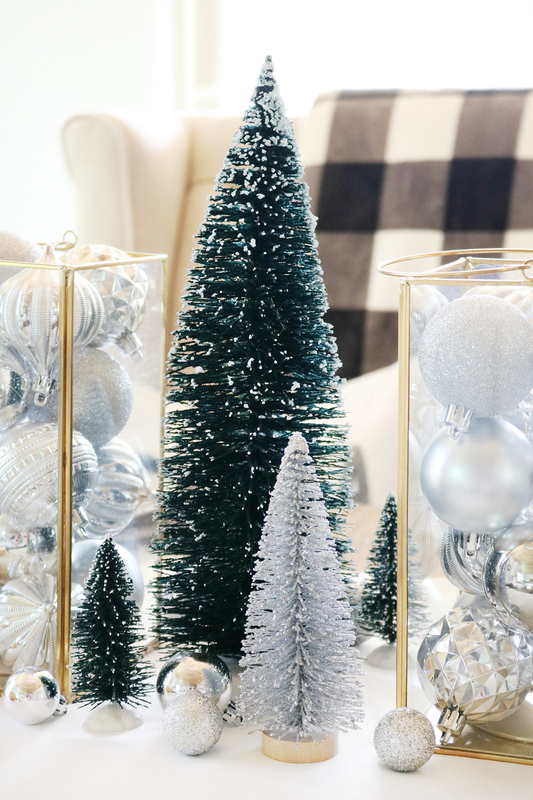 While shopping at my local Walmart stores I came across the dark green bottle brush trees in a variety of sizes, I knew they’d be perfect mixed in with my new favorite Better Homes & Gardens Metal and Glass Gold Lanterns the center of the table. 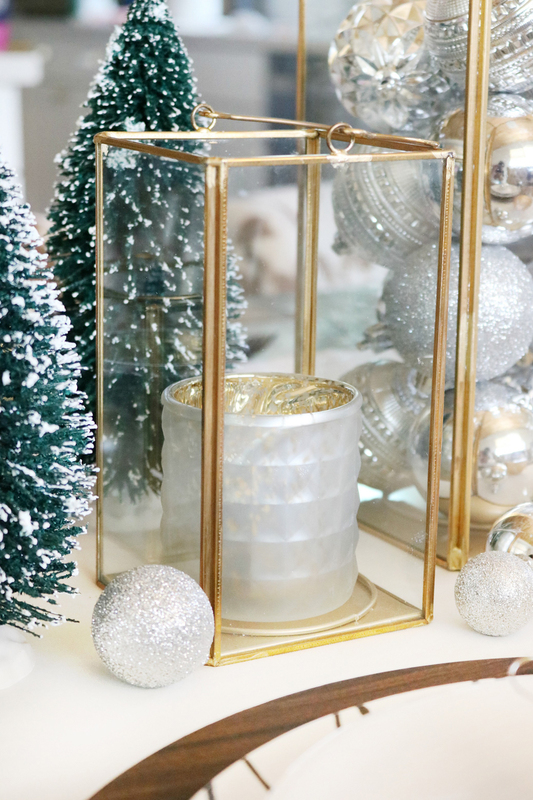 I snagged the gold lanterns in all three sizes, small – medium – and large. 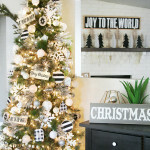 I chose to fill the largest lanterns with silver Christmas ornaments, the medium sized lanterns with the Better Homes & Gardens Gold Mercury Glass Tealight Votives, and the smallest lanterns I turned into a mini snowglobe with fake snow and mini bottle brush trees. You could fill these lanterns with anything, that’s what I really love about them. 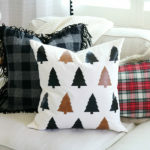 Think candles, jingle bells, pinecones, a small vase placed inside with florals, so many ideas! 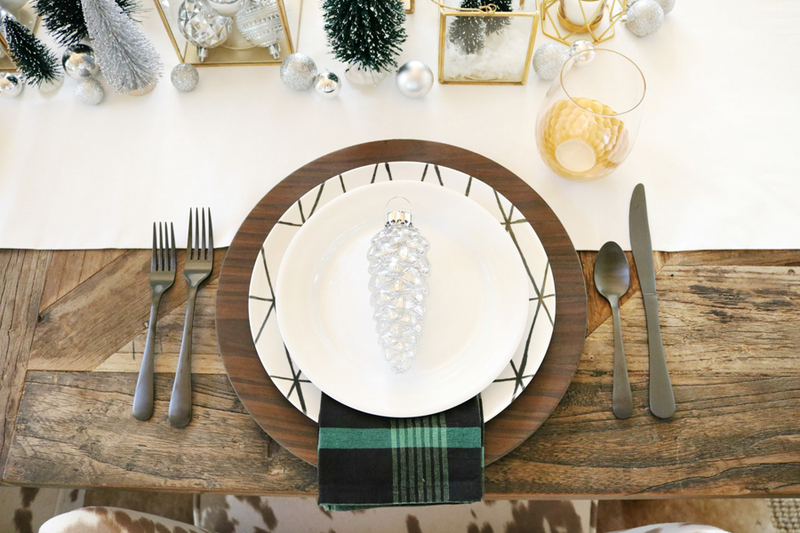 When it came to picking out items for the place settings I knew I wanted a modern touch. I’m so in love with the fun geometric Better Homes & Gardens Grey Triangle Lines Dinner Plates I found. They are actually melamine, I loved the pattern so much and knew it was exactly what I wanted for the table so I decided to use melamine for both the dinner plate and salad plate. I mixed a simple Better Homes & Gardens White Salad Plate on top of the patterned plate. When it came to the charger I lucked out and found these Better Homes & Gardens Faux Wood Chargers in my local store for under a $1 a piece. 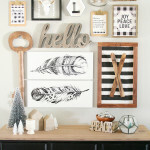 They aren’t sold online so check your stores, they are such a great wood color and the texture feels like real wood. 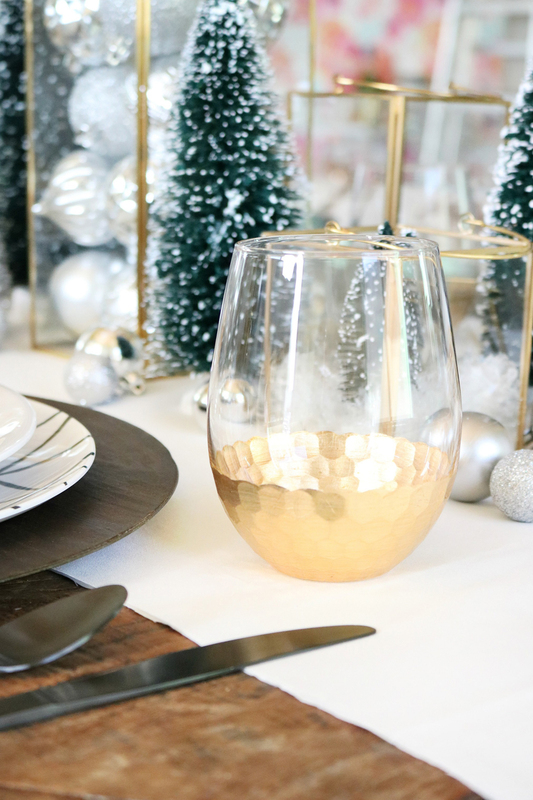 When it came to the glassware I’d been eyeing these fun Better Homes & Gardens Honeycomb Stemless Wine Glasses for a while and really wanted a reason to buy them. 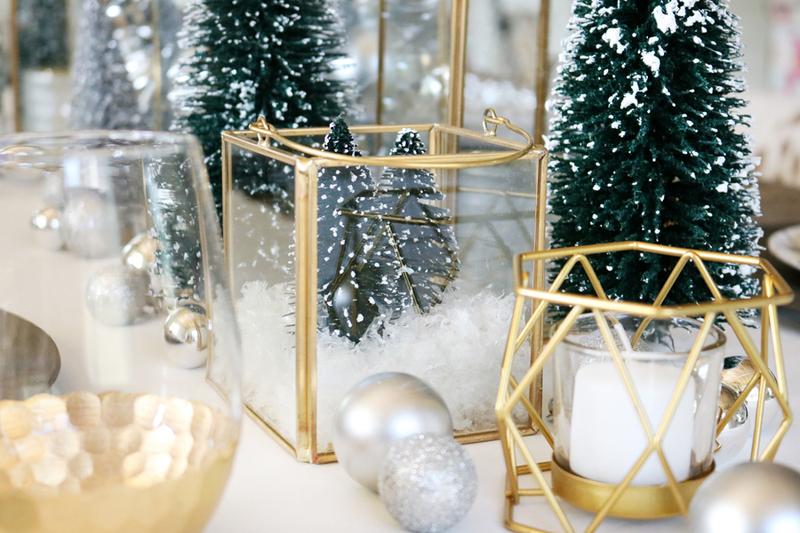 They were the perfect addition to this table, metallic with a touch of geometric design. 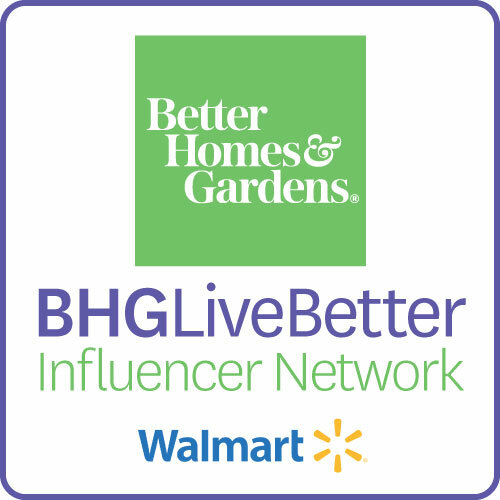 I also really love the new Better Homes & Gardens Corin Black 20-Piece Flatware Set, black flatware is so popular this year and it’s amazing. It also comes in rose gold if black isn’t your thing. They are both so pretty. 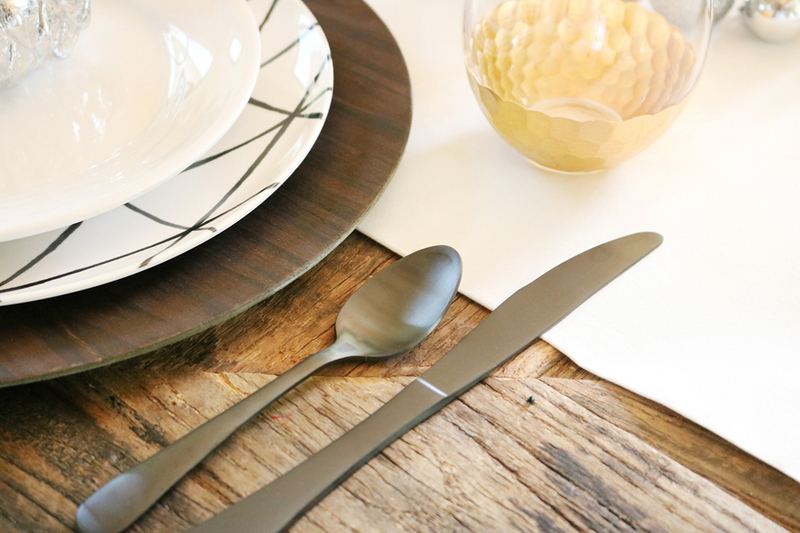 The black flatware added another layer of metallics to my table setting with its gunmetal like finish. 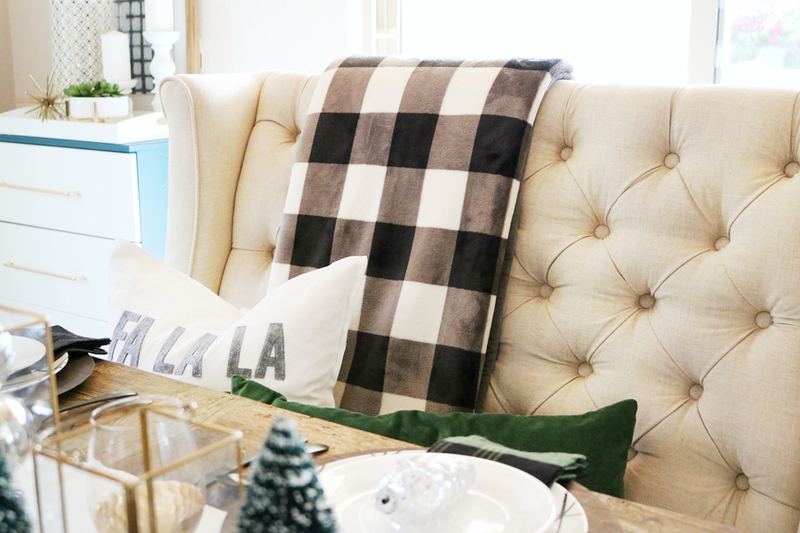 I added this incredibly soft Better Homes & Gardens Velvet Plush Reverse to Sherpa Throw Blanket for an added pop of black and white. 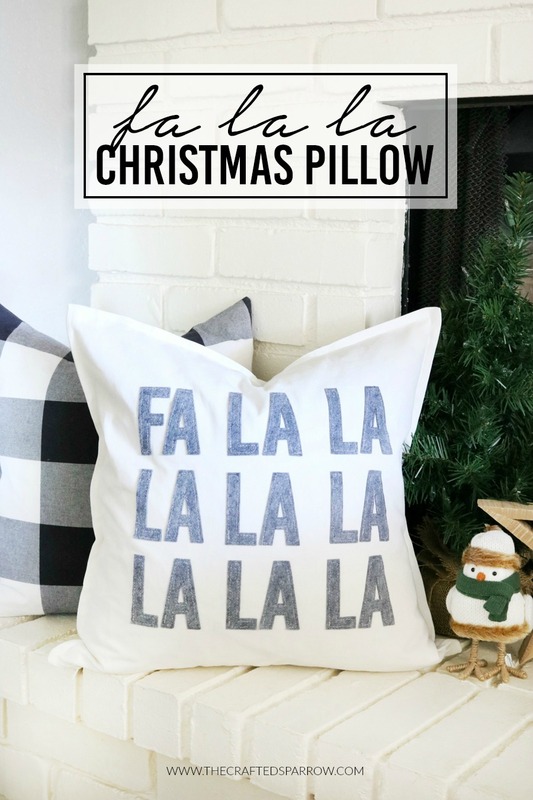 I love these throw blankets, they are so stinkin soft and cozy perfect for chilly fall nights and they come in some really cute patterns. 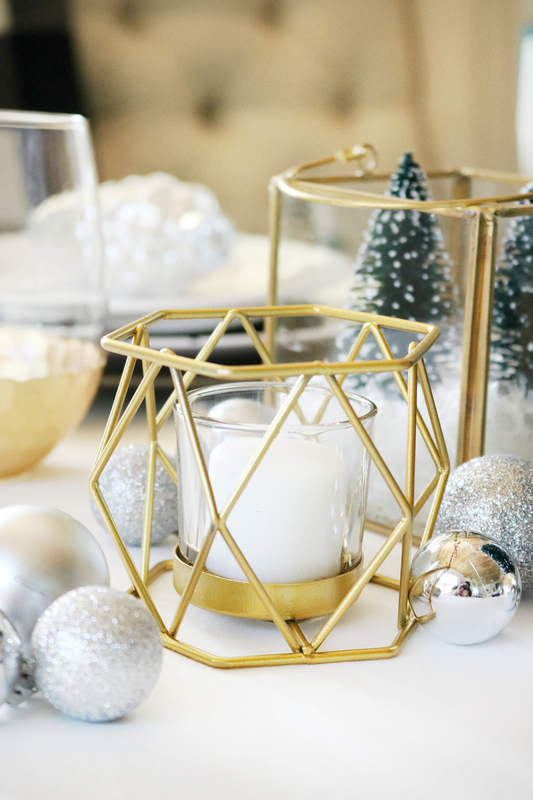 Last but not least for the final touch of metallics and a little more geometric design I spotted these Better Homes & Gardens Gold Wire Tea Light Candle Holders in my local store. 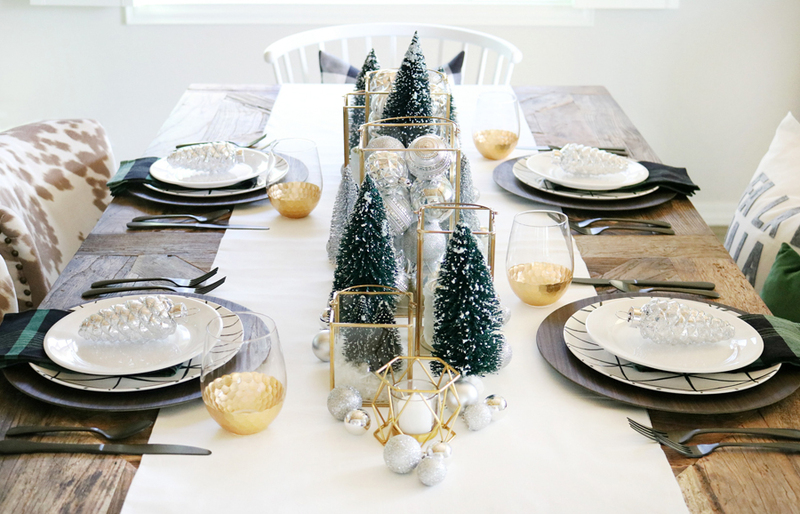 I added one to each end of the table to help add a little glow of candle light with the other candle holders I placed inside the gold lanterns. I love how easy it was to put everything together. 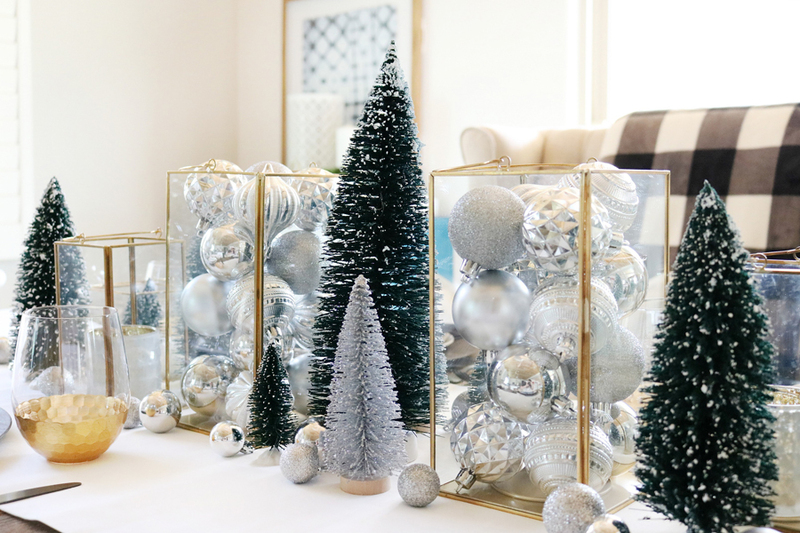 The table wasn’t overly complicated to decorate, it wasn’t too tall which allows for guest to still speak to each other, and I love that the metallics make it feel bright. The best part? I found everything pictured here at Walmart so I wasn’t running around to a ton of different stores trying to get everything.